Drinking diet soda is just as bad for you as having a regular soda, a new report has claimed. Even sugar-free drinks are raising the risk of weight gain, type 2 diabetes, dementia and stroke among US adults, the panel of doctors and researchers has warned. They said that children are at an even greater risk of disease because consuming diet drinks at such a young age can create behaviors that follow them throughout their lives. 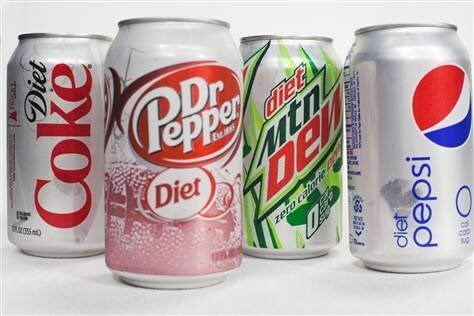 With obesity rates continuing to balloon in the US - and diabetes, heart disease and certain cancers following these trends - the experts say it is vital now more than ever to lay down the diet sodas to help curb the growing epidemic. The group, from the American Heart Association, did note that diet drinks are often used by people who generally consume large amounts of sugar-sweetened beverages (SSBs) as a way to wean themselves off. 'This approach may be particularly helpful for individuals who are habituated to a sweet-tasting beverage and for whom water, at least initially, is not a desirable option,' the report said. The writers also pointed to a number of self-reporting surveys that showed an encouraging trend of Americans consuming fewer sugar-laden and diet drinks. According to the National Health and Nutrition Examination Survey, adults drank an average of 5.6 ounces of low-calorie drinks per day - the equivalent of about half a can of soda - in 2006. The data showed that by 2014, adults were drinking just 3.8 ounces per day. For kids and teenagers, they were drinking less than an ounce per day. Meanwhile, according to the survey, adults drank an average of 16.2 ounces of sugar-sweetened beverages (SSBs) per day in 2000, which fell to 8.4 ounces in 2014. The decline was even more drastic among kids, from 19 ounces per day in 2000 to 8.6 ounces in 2014. The American Heart Association, in 2016, released its recommendation that children consume no more than six teaspoons of sugar per day. 'We want to make crystal clear it's important to maintain that [downward] trend,' said Dr Alice Lichtenstein, vice chair of the writing group and a professor of nutrition science and policy at Tufts University in Boston. The advisory particularly recommended that children stay away due to the lack of data on the long-term effects of these low-calorie drinks. 'One question we discussed is whether for children who are obese and who drink regular soda on a regular basis, is it OK for them to drink diet soda instead?' said Dr Frank Hu, a member of the writing group and chair of the nutrition department at Harvard University. However, a report from the CDC released in February 2017 found that teens' daily intake of milk also declined (from about 44 percent to 37 percent), as did 100 percent fruit juice intake (27 percent to 21.6 percent). Although the FDA has labeled low and no-calorie sweeteners - sold under names such as Splenda and Sweet & Low - as 'generally recognized as safe', many of the experts say that this shouldn't be taken as a ringing endorsement. 'Artificial soda, there's nothing good about it,' said Christopher Gardner, director of Nutrition Studies at Stanford University, who was not part of the AHA advisory.